IBS Center for Management Research (ICMR) is a premier case development center developing high-quality teaching cases in Management. ICMR is a center of excellence at IBS Hyderabad, a constituent of IFHE (deemed-to-be-university). 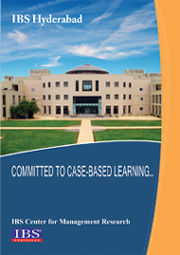 IBS Hyderabad, which has consistently ranked among the leading B-Schools in India, has adopted the case study method wholeheartedly and is the only one in India to offer a unique 100% case-based MBA. At ICMR, a dedicated and dynamic team works towards fulfilling the institution’s mission of developing high quality case studies. The case studies are usually written by a team comprising Faculty members and Research Associates. It not only ensures that IBS Hyderabad has a regular supply of case studies, but also caters to the increasing demand for quality case studies from other B-schools in India and abroad. Our cases have found extensive usage around the world. More than 200,000 individual copies of our case studies have been purchased by leading B-schools and universities around the world and over 10 million copies of our cases have been printed in international and Indian textbooks and casebooks. Our cases consistently win awards in several global case writing competitions.